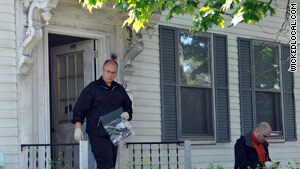 An investigator carries a plastic bag from a house in Watertown, Massachusetts, on Thursday. (CNN) -- Three men picked up in New England in connection with the failed Times Square car bombing are being held on immigration charges and could appear in court early next week, a federal law enforcement source said. Two men arrested Thursday in Massachusetts have been identified as Pir Khan and Aftab Khan, the source said. The third, Mohamad Rahman, was arrested in Maine. The charges aren't terror-related, and the men are being investigated for any possible links to Faisal Shahzad, the Times Square car bomb suspect, sources said. They were arrested Thursday as federal law enforcement officials executed search warrants. One focus of the investigation is an informal system of transferring cash internationally known as a hawala. The method may have played a role in financing operations like the attempted Times Square attack. The Khans don't appear to have been running a hawala but might have been providing funding as needed to the hawala system, the source said. Investigators were trying to determine whether they knew what the money was being used for. Rahman's connections to the case don't appear to be as significant, the source said.